And the 87th chapter of the Uttara Kanda of the Brahmanda Purana says the sage did penance on the banks of the Padma Thadagam, as it was filled with lotus flowers, near the Gaja Giri Kshetram (the present Anaimalai) seeking progeny, and wanted the Lord to appear in His Narasimha avatar. The Lord appeared as Ugra Narasimha and the heat that emanated from Him was unbearable. Even the celestials were affected by it and they all came to Gaja Giri Kshetram and prayed to the Lord to calm down. The Lord could not be pacified and then they sought the help of Prahlada, whose arrival quietened Him to some extent. They prayed to the Goddess Mahalakshmi, who also took Her abode in Him as Narasingavalli, after which He became Yoga Narasimha. 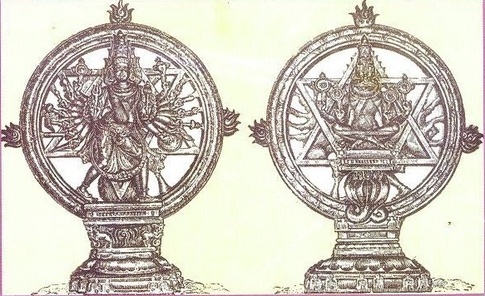 But my question is, why is Yoga Narasimha depicted on the back of images of Sudarshana? I've seen various symbolic justifications for this, like Yoga Narasimha being the Shakti behind the Sudarshana Chakra, or Yoga Narasimha and Sudarshana representing Purusha and Prakriti, but what does Hindu scripture say on the subject? Can anyone provide a fuller translation of this passage? It might contain the explanation. According to [Pancharatra] Aagama Sastras - there is a need for Sudarshana Azhwar to be always backed up by some form of energy. Ideally, it is supposed to be a "Simha [Lion] Moorthy"- any Simha Moorthy for that matter - for the same purposes as mentioned that the Sudarshana derives his energy from Yoga Narasimha - although no mention has been made of the Avatar. It has been put into practice by our acharyas and guru's who decided to modify the aagama slightly (or could have crept in) - that Narasimha would be the most apt Moorthy behind the Sudarshanazhwar. So where in the Pancharatra texts does it say that you should put a lion on the back of images of Sudarshana? Does anyone know any other scriptures which explicitly address why Yoga Narasimha is put on the back? And on a side note, does Vishnu's actual Sudarshana Chakra have a carving of Yoga Narasimha on it? Lord Narasimhas nails an incarnation of Sudarsana Chakra Lord Nrsimha is so exalted that even His nails are glorified by the Vaishnava acharyas! In the Sudarsana-sata-nama stotra of the Sri Vaishnava sampradaya, it is said that Lord Narayana's Sudarshana Chakra descended as the tusk of Varaha, the axe of Parasurama, and the nails of Nrsimha. In this way, the nails of Nrsimha accompany the Lord in His various avatars. Trivikram Panditacarya a disciple of Srila Madhavacarya wrote the Nakha Stuti ,meditation on Lord Narasimhadevas nails : Nakha-Stuti - First Sloka pantu asman puruhuuta vairi balavat matanga madhyat ghata kumbi uchadri vipatana adikapatu pratyeka vajrayitabr "O Sri Nrsimha, who is omnipresent, may your nails protect me and others at all times. Just as a lion attacks powerful elephant groups and splits apart their heads with its nails and the vajrayudha (Indra's defense weapon) splits the highest mountains, in the similar way, the Asuras (who through the blessings of Sri Brahma, Rudra and the demigods) are like powerful exhilarating elephants who are easily killed by each of Sri Nrsimha's nails which are precious and powerful." Second Sloka prathatha shrimadkanteravasya sunakhara darita arati duura pradvastha dvanta shanta pravitata mansa bhavitah buribhagai "All demigods are devoted to and praying to these nails, which eliminates all bad elements in this world. They are very [devoted to] these nails as it will give all six senses of a brahmana or good qualities of the devataas. These nails will even give complete knowledge and the demigods come out of the darkness (of ignorance) by praying to these nails, they get peace and knowledge of all the qualities of Sri Hari." Third Sloka lakshmiikanta samantata kalayan opi eshita te samam pashyami naiv yah uttamavastu ataratah astama rasaha. "In the middle (of what), is the image of Yoga Narasimha, who is Eternal, and is bound by a Yoga Patta. He is four armed, and bears four Chakras (!) in his four arms. He is situated under the Ashoka Tree, and is radiantly adorned, ever willing to destroy his devotees' troubles. He is the Supreme One, who is the ocean of countless Kalyana Gunas, excellent qualities, who causes his Bhaktas to tremble with fear. Sometimes both Yoga Narasimha and Sudarshana are contemplated upon; other times only the radiant Sudarshana is contemplated upon. (I am not sure of the next line: The contemplation of both of them is enough to destroy a multitude of astras, for they are verily the sacred Vishnu Mantras personified). Thus, the Supreme Personality of Godhead, in his form as Sudarshana Chakra, destroys all Danavas and Daityas, with its infallible powers, which manifest as astras from His person. To control these bad elements, the Lord took upon this form of the Chakra, and thus is able to protect his devotees." So the purported meaning, I think, is the bolded letters. Not the answer you're looking for? Browse other questions tagged vishnu weapon idols pancharatra narasimha .